Discussion in 'vBench (Works in Progress)' started by MarquisMini, Jul 1, 2008. 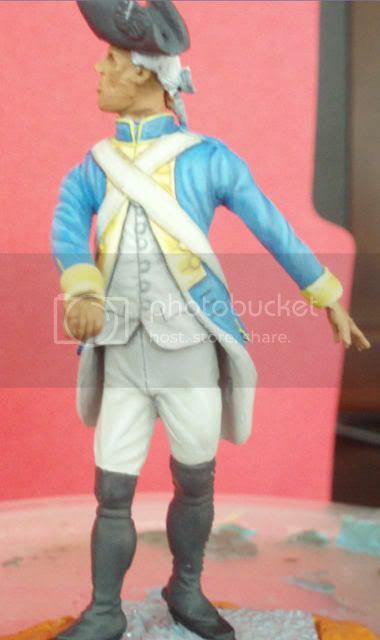 I am attaching photos of my most recent addition to the Yorktown diorama. 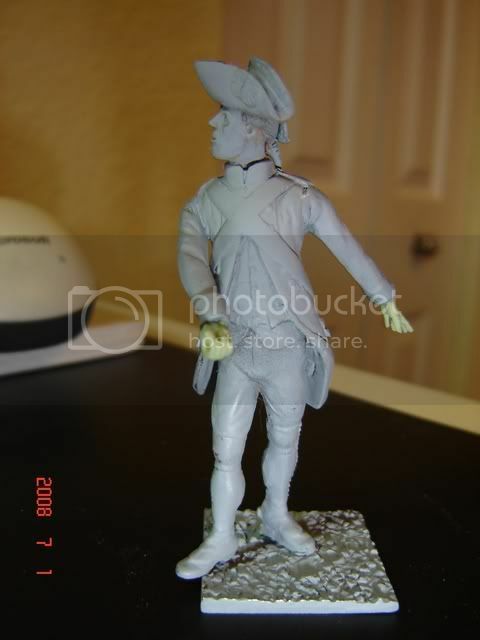 This figure will be a sergeant for the regiment Royal Deux-Ponts. 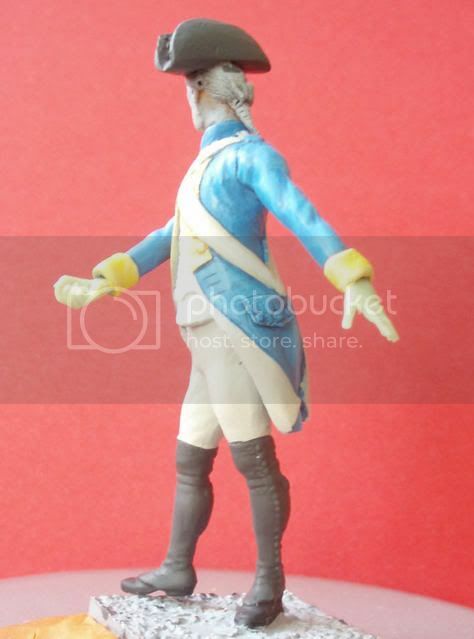 The body and legs are originally from a Modeles et Allures figure -1767 regulation. I have used Procreate to change to the 1781 regulation by modifying the shape of the vest and collar, making enhancements to the details in the coat/lapels, changing the epaulettes, and increasing the definition in the breeches and gaiters. I also added a 2nd crossbelt. The head was originally from JMD, as were the hands. I expect him to be holding a pike (across his body) and to be keeping the infantrymen in formation. The arms and hat are completely scratch built. 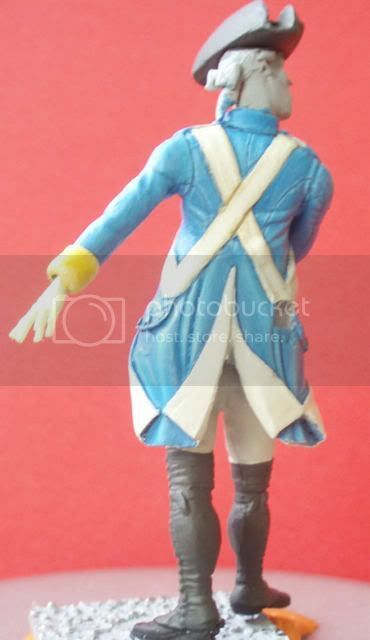 Colors for the coat - dark sky blue with lemon yellow facings - white vest and breeches. Comments and suggestions welcomed. Thank you in advance for your thoughts or comments. Really clean beginnings on a unique and interesting pose, the musculature in the arms shows well and the position seems almost graceful...yellow and blue are challenging colors to say the least. Just to clarify, this sergeant will be holding a spontoon in his hands, in front of (to align) the regiment right? Looking forward to future updates. That is a fascinating pose - never seen it done before! Well done!!! An excellent face also!! Dan,thanks for taking the time to post your comment. nice start to this very interesting project. Why did you use black leggings instead of the white in your reference? The reason i did the gators in black is that generally some French regiments wore black or white and basically that was up to their colonel,in fact,each infantryman had one pair of white linen,another pair of blackened linen and black woollen cloth gaiters.Due to the season that i am representing the battle,some of the regiments i will represent in white gaiters and only the Royal Deux-ponts will be represented in black linen since is really hard to revw accounts for that specific day in battle. Thanks for your question and let me know if you need more detail i will send you a pm with links to the source of it,thanks again. Thanks for explaining. 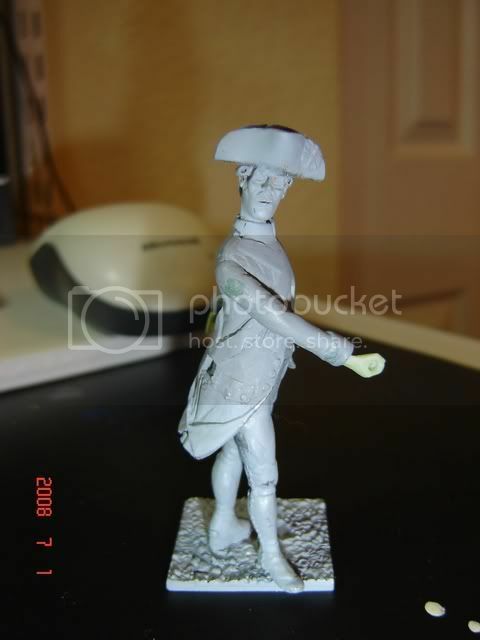 I also enjoy the 7 Years War period and have an on/off project to sculpt some Historex dragoons. Please post more of your stuff. 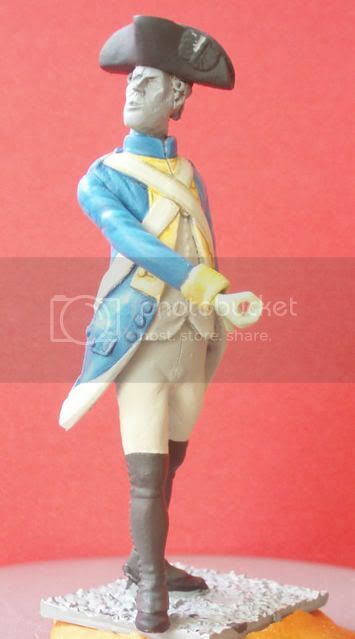 While slightly past the 7 Years War, I have purchased several figures from him and converted the 1767 uniform to the 1779 standard. 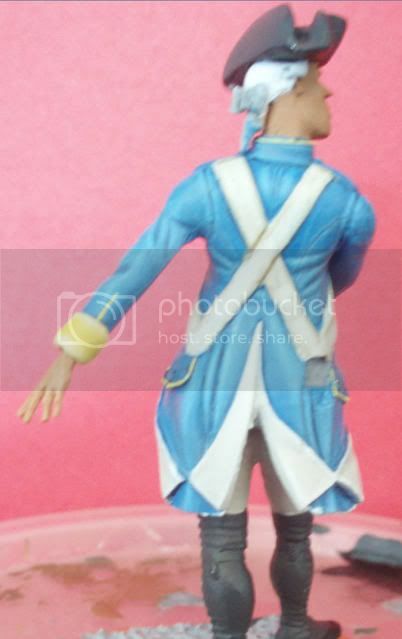 The figures are listed as 54mm, but are actually closer to 62mm foot to eye. thanks for info. I am quite familiar with Cyrille Conrad's work for Le Cimier as I have a number of his pieces depicting kings and queens of France. I believe that he is the son of Pierre Conrad(? ), both very talented. Cyrille's pieces are slightly bigger than 54mm, approximating 60mm. The pieces that I have are solid castings with little undercut. For my conversions, I prefer to use plastic as these are easier to carve, cut etc and are lighter than metal. The Historex kits offers for me fantastic range for this period. I take yr point that there are subtle differences in cut between the baggy 1767 and slimmer 1779 coat. I also use parts from the old Airfix American War of Independence kits. I love E Leliepvre (sp?) drawings for this period and use them as references. Hello Victor,thanks for taking the time to read the post. I didn't know that Cyrille has done work for Le Cimiere. He and I have spoken a few times and all I know is that sculpting is a second job for him and he produces his own "brand." It is funny that you mention Historex...I do use pieces and parts from them, especially the fleur de lys for the turnbacks. You have no idea how many hours I spent trying to draw them on the turnbacks before I discovered them at Historex. 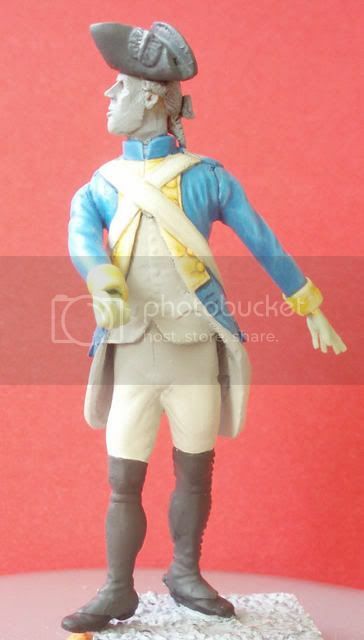 In fact, many of the soldiers in my dio have the Historex tricorne hat. 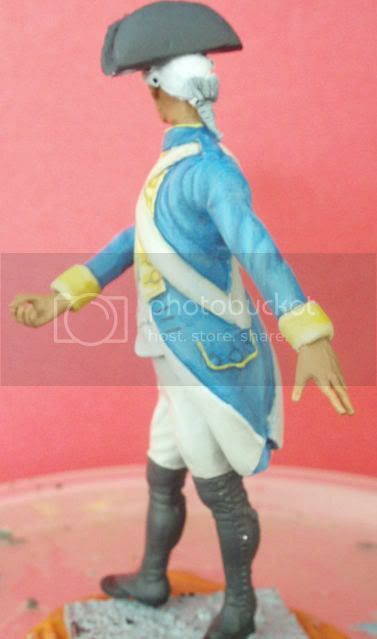 I have found that some pieces are small for these 60mm figs, but its not off the chart. Another reference I use often that may be of interest for you: Men At Arms, Osprey Publishing - The French Army in the American War of Independence. Thanks again for your post and we'll keep in touch. Great work sofar Daniel! For the white I would say some more shadows but this also depends on the photo's. Thank you for taking the time to comment. You are correct, the limitations of a common digital camera doesn't do justice to the highs and lows, particularly on a white cloth. Looking to get a good SLR camera before end of year. Will post future updates and I progress.